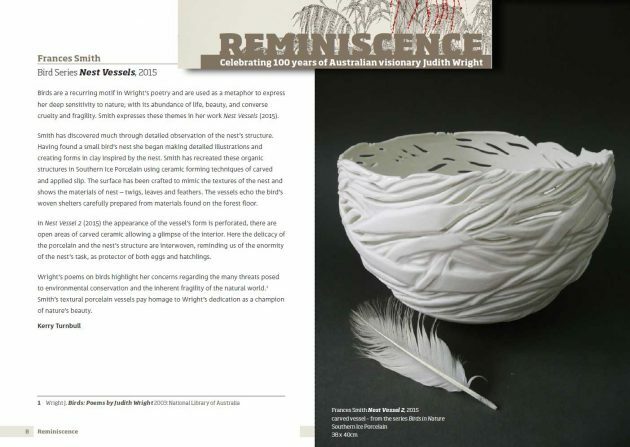 The Reminiscence exhibition which celebrated the centenary of the birth of Australian poet and conservationist – Judith Wright – is now touring regional Queensland under the auspices of the Flying Arts Alliance. The joint exhibition of the works of artists Fiona Rafferty and Frances Smith opened in Brisbane on Saturday 5 December last year at the Judith Wright Centre. In paintings and drawings, Fiona Rafferty brought to life the Tamborine Mountain environment where Wright produced much of her poetic works. She also made comments on the effects of mining and development on the unique Australian landscape. The exhibition was curated by Charlotte Tegan, an artist and photographer in her own right. After the success of the launch and exhibition, Flying Arts and Fiona Rafferty arranged to have the exhibition tour regional Queensland, so the powerful message of Judith Wright’s work and influence could be shared with people who could not travel to Brisbane to see the exhibition in its full form. It was planned that the artists ideas and working methods would be shared with the regional audiences, either by direct presentations by the artists or through presentations by the Flying Arts team. Frances Smith prepared an artist’s workbook that looked at her artistic process for the exhibition pieces and has been used in presentations about Reminiscence in regional galleries. Responsibility for the touring exhibition was passed to another experienced artist and curator, Maya Carter-Malins, who took over day-to-day responsibility for Reminiscence when Charlotte Tegan focussed on completing her PhD. Dates and places for the reminiscence touring exhibition can be found on the Flying Arts Alliance website.